Of all of the tri. movies we’ve seen so far, Determination is the most deceptive. It strays into fun and off-kilter moments more than any other, yet heartbreak and uneasiness lurks around every corner. It accomplishes more objectives from across the board than any of the other movies while still feeling like nothing important happens until the final few minutes. It also features two characters that become so good at lying to themselves that we may be prone to thinking the lies are supposed to be taken as truth. Given how poorly these lies fit Joe and Mimi, it’s easy to get this movie wrong. This is where watching a dub can make everything easier to process. That’s not the norm for Digimon. Our dubs have been more prone to missing details in the exposition, ironing out the nuance of certain characters, or removing important cultural contexts. Heck, the dub is even guilty of the latter, as it doesn’t attempt to translate the stigma of Mimi’s returnee status, instead just portraying classmates disgusted at the new girl acting like she owns the place. Why this happens doesn’t matter anyway, only that it does and Mimi has to deal with it and her rash actions in the Ogremon fight. Joe’s a conflicted mess the whole movie. Both come to believe some very wrong things about themselves, and hearing them said aloud assures us of how wrong they are. For all the times Mimi is called narcissistic and self-centered, there’s no big climactic revelation to make her realize she isn’t. She doesn’t need one. What she needs is to realize her actions, even the ones that have unforeseen negative consequences, are all for the right reasons. In their own way, Joe and Meiko remind her of this, both jealous at her willingness to act and one clearly appreciative of her doing so. Mimi sees through Joe’s alleged cowardice quickly. After his long rant about why they still have to perform as digidestined and why he isn’t allowed his own life, she points out he made the choice not to attend school. It’s a quick rebuttal, easy enough to forget when it’s the end of a long wall of text with minimal animation. But hearing it makes it apparent that Joe’s only protesting the obligation to fight to hide from his real source of misery. Watching the dub also helps emphasize the many little things that become important later. While it’s still too far-fetched to say Maki’s actions at the festival were all deliberate, signs of her eventual betrayal are buried in her tone. Kari’s malfunctioning camera (a clue to Meicoomon’s power to distort electronics) now gets an audible murmur of suspicion. We don’t know what information the adaptation is working with so this can’t be taken as a certainty, but the reactions to “Ken” all point to a certain status quo regarding the missing 02 kids. The Tai/Matt conflict isn’t adapted well, with the climactic events of Reunion simplified so much they’re flat-out wrong, but thankfully their dispute ends up petering into an anticlimactic nothingness next movie anyway, so it’s hard to dock too many points. 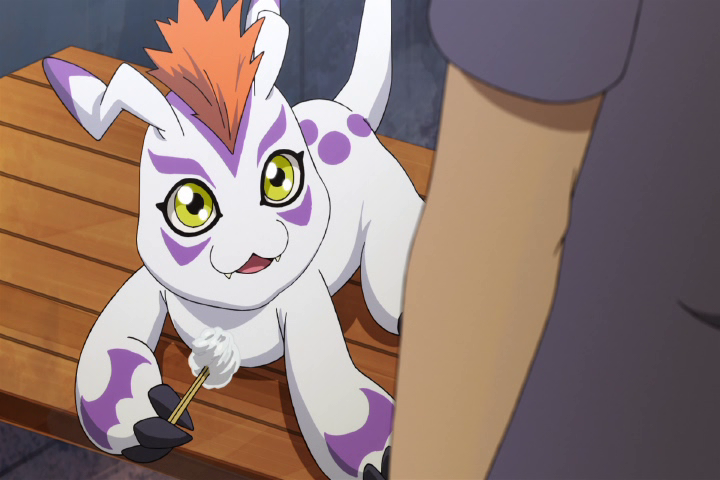 Other scenes are better for their heightened intensity: the dub continues to push the still-unconfirmed notion that the infected Digimon are targeting one or more of the kids or their partners, but unless that’s both wrong and plot relevant, we’ll take the added bit of dramatic suspense. Trying to accurately describe Oedo-Onsen in few words is difficult culturally, since it’s more than a bathhouse and not dissimilar to a theme park... just with a functional bathhouse theme that makes it hard to call it one. Settling for “spa” wouldn’t be accurate for the original, but for an adaptation works quite nicely. As you can probably imagine, any sexual connotations of Mimi’s obi spinning are gone in the dub. In the context of tri. only, TK saying his last name differs from Matt’s because his mom remarried is a clean explanation that doesn’t ruin anything in the story. When taken with Adventure as a whole... silly dub. 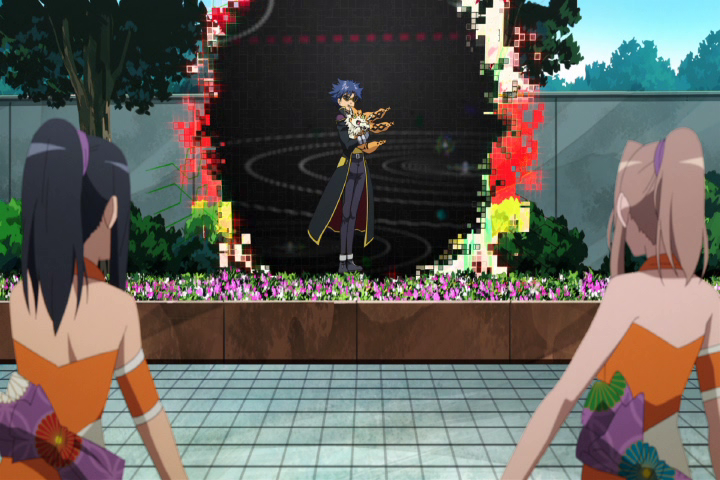 At one point, Tai calls Sora “sis” and Tentomon calls Izzy “sister.” One’s an odd mistake. One’s hilarious. Once again, instead of masking (or even subtitling) Japanese text, emails are read aloud, sometimes by the sender, sometimes by the reader. Sora reads the email she sends Joe about Gomamon at the spa gave us a fleeting hope we’d get a voice for Joe’s girlfriend later. Alas, he reads that one himself. Awesome that they brought back Paul St. Peter and Beau Billingslea for uncredited reprisals of Leomon and Ogremon. Ogremon only grunts and Leomon sounds a bit more gravelly than we perhaps remember, but it’s good to hear old voices again. Given his voice actor, perhaps it’s appropriate that Tentomon captures the spirit of the old dub the best with the most added jokes. Had to sneak in one Nigerian prince joke, didn’t you? I love your previews to your articles :) This one is especially funny! Does the dub keep Joe's crest as reliability or does it switch to sincerity? Anyhow, Tentomon calling Izzy sister is hilarious! "Gravelly"? Paul St. Peter's voice was straight-up Cherubimon. Which baffled me, as surely Paul was allowed to listen to his old Leomon clips before recording. He had the same problem as SaberLeomon in Data Squad, too.